We finally found a bed for Oscar that he loves! When I bought Oscar’s first bed, I thought it would be the perfect bed for him to cuddle up in. Unfortunately, that bed ended up being all wrong for him. It was a cup-shaped bed with higher sides, and Oscar’s little legs were too short to climb into it. He occasionally napped in it if someone picked him up and put him in, but he wouldn’t climb in by himself. Baby Oscar struggling to get into his first bed. I decided to hold off on buying him another bed until I figured out what he liked. Instead, I left blankets around the house for him to nap on and paid attention to how he liked to sleep. First, he has short legs and needed to be able to get into the bed easily. Second, he really likes his snout covered while he’s sleeping. If he’s in a blanket, he’ll push the blanket up over his snout to cover it; if he’s napping with one of us, he’ll try to push his snout into an armpit or a nearby pillow. So, I needed a bed he could easily get into but also one with a place for him to hide his snout. Oscar loves hiding his snout in his new bed. 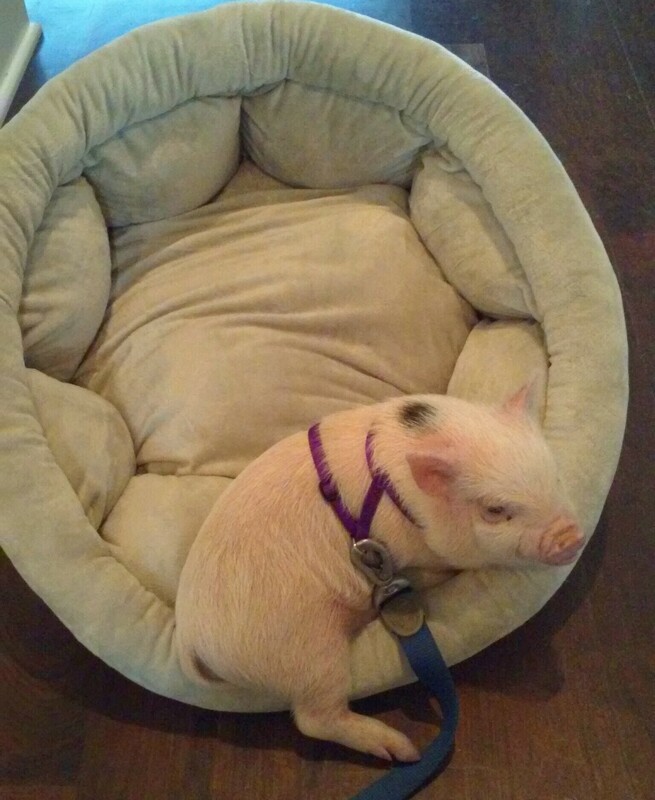 I kept my eye out for the perfect mini pig bed for several weeks and finally picked one that he loves. It’s really soft and easy for him to get into, and it has a crevice where the sides of the bed meet the middle area that he can dig his snout into. Interestingly, it’s a similar design as his previous bed, but the material of the new bed is softer and less structured, allowing him to step onto the edge to get in if he needs to. Here is a bed that’s really similar to the one I got for Oscar. Oscar’s bed is bigger (31×9) as opposed to this one that’s 22×6 and the material is a little different, but I wanted to give an example of what worked for Oscar. A major plus is that Oscar’s new bed is machine washable. After Oscar’s mange situation, I refuse to buy a pet bed that can’t be washed easily. One potential negative is that I don’t recommend this bed if you have any strong chewers. 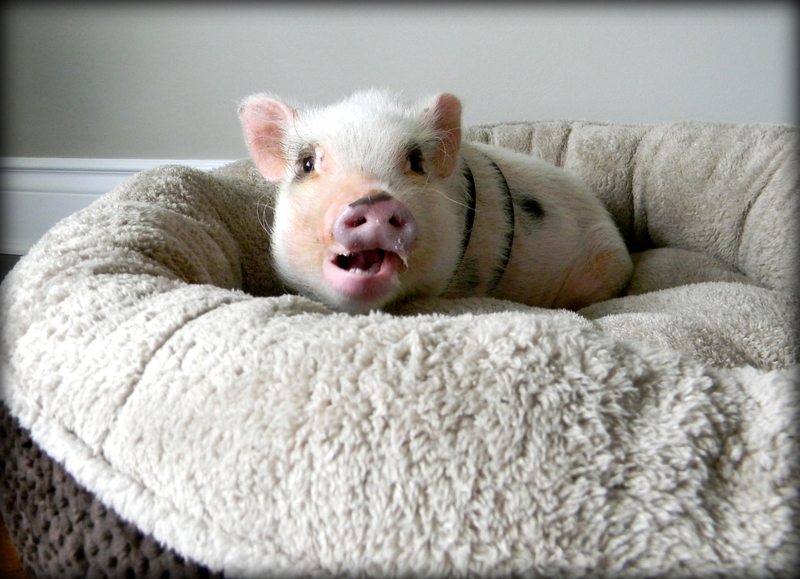 Oscar doesn’t chew at this point (aside from toe nibbling) so this soft, cozy material works for us, but you might want a tougher material if your mini pig or another pet in the house likes to chew. A shopping tip: If you have a Marshalls or TJ Maxx store nearby, I highly recommend checking there for similar beds as they usually have a great selection. I’m so excited to have found a bed Oscar loves! 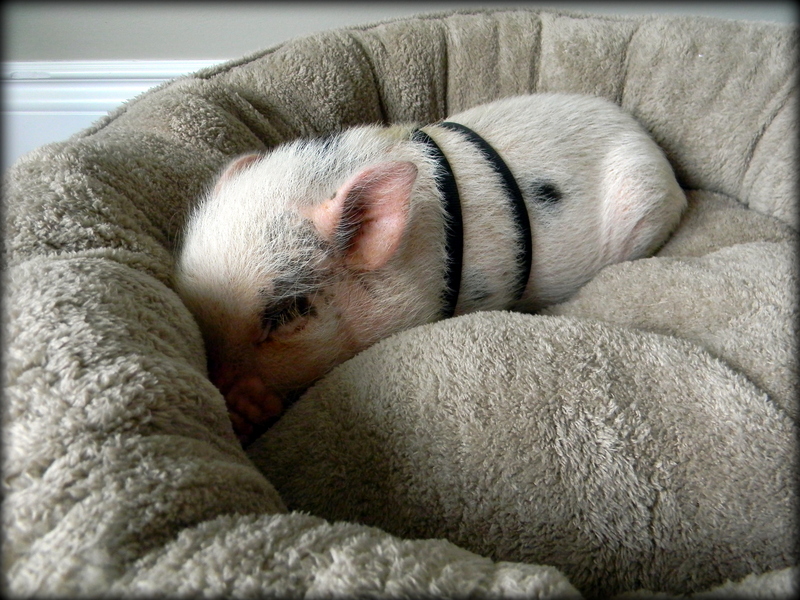 There’s nothing quite like a cozy, happy mini pig. Note: Although I personally recommend the items discussed in this post, some of the links are affiliate links. LifeWithaMiniPig.com is a participant in the Amazon Services LLC Associates Program, an affiliate advertising program designed to provide a means for sites to earn advertising fees by advertising and linking to amazon.com. Mini Pig Oscar’s Half Birthday Party! We just got a new piggy her name is Bella. 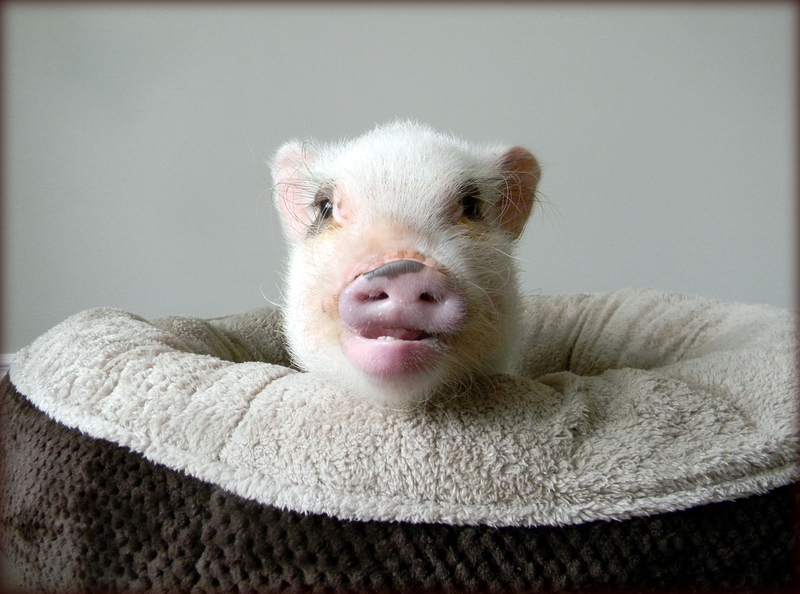 She’s wondeful but have a question about the playpen ya got your piggy. 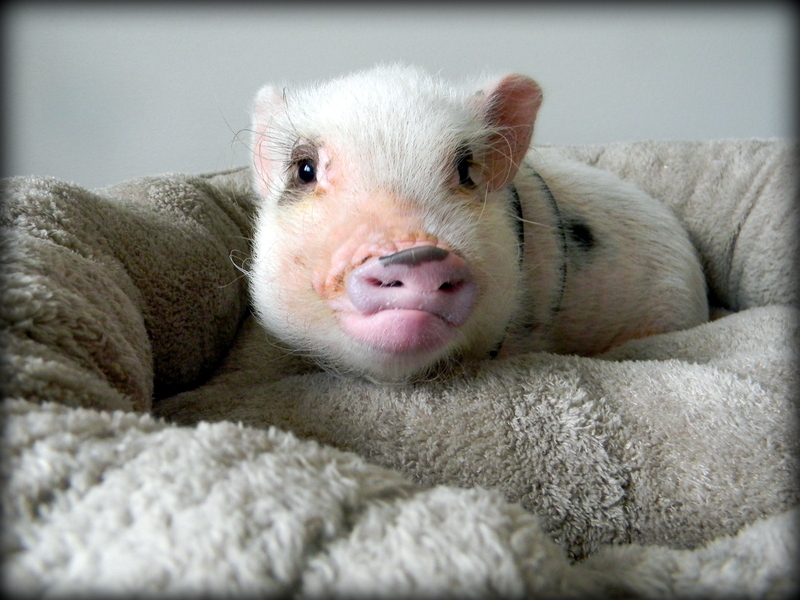 I read some reviews on that it was easy to tip over and and does your piggy chew it? Bella chews everything even her pee pads. We are looking for something we can have in the house for her to be safe in to play and sleep in and also outside intil we train her in the yard. I thought that the play pen was a great idea while we are training her not to chew up the house and potty everywhere.